The San Francisco Police Department made history on August 15, 1988 when they made the first arrests ever for sharing food with the hungry. Nine volunteers arrived at the entrance to Golden Gate Park with organic vegan food prepared to share with the several hundred souls that were making the dense wooded park their home. A reporter with the San Francisco Chronicle learned of the the department’s plan to deploy 45 members of the Tactical Squad to Haight and Stanyan to arrest the cooks and shortly after noon the nine Food Not Bombs volunteers were captured, cuffed and driven off to jail. The activists sang “we will not be moved” as the police vans removed them from the scene. After spending most of the night in a holding cell at police headquarters they were released to discover that the Chronicle had published a huge photo of riot police guarding the food from the hungry with a headline proclaiming “Nine Volunteers Arrested For Feeding the Homeless at Golden Gate Park.” The Food Not Bombs answering service on Polk Street was swamped with calls from people wanting to help. Offers of food, legal support, help with cooking and even commitments to risk arrest if necessary flooded in. The August 15, 1988 arrests marked a change in American societies view of the homeless and sparked a global movement. The San Francisco Police made over 1,000 arrests for the “crime” of “making a political statement” by sharing food with the hungry in public. Remove the Food Not Bombs banner and literature and provide your meals inside the National Guard Armory on the edge of the city or be arrested on felony conspiracy charges. Twenty five years after the first arrest the act of showing compassion and effort to encourage the redirection of resources from war to providing for our community is as threatening to the authorities as it was in the summer of 1988. In response to the impact of Occupy Wall Street and other occupations over 50 cities in the United States have banned or passed laws restricting the sharing of food in public. Authorities are currently threatening to stop Food Not Bombs meals in Seattle, Portland, Boulder and Detroit. Yes Detroit, just as the city is filing for bankruptcy and has unimaginable need to feed its hungry the authorities are threatening to arrest Detroit Food Not Bombs. Hunger and poverty are on the increase yet so is the desire to respond to the crisis. New Food Not Bombs groups form every week. Volunteers from Umuahia, Nigeria and New Paltz, New York asked to have their chapters included on www.foodnotbombs.net today. Activists reported that there are over 100 groups in Indonesia and 30 chapters in the Philippines with the Davao City chapter posting photos of their 13th July 5th anniversary celebration on our Facebook last week. A new chapter started in the southern zone of Mexico City and groups in New Zealand announced their next Really Really Free Market. 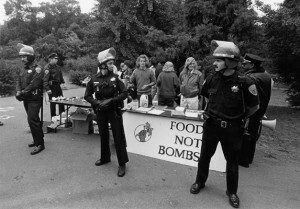 The impact of the August 15, 1988 arrests continues to this day having inspired people to start the first wave of Food Not Bombs groups that in turn inspired others to start a chapter in their own communities so that there are volunteers recovering food, cooking vegan meals that they share with the public in over 1,000 cities around the world. You can join this inspiring movement. The most important thing you can do is start or join an already active Food Not Bombs group in your community. To learn more you can visit www.foodnotbombs.net or call us at 575-770-3377. You may want to get a copy of our book “Hungry For Peace” to learn more about Food Not Bombs. You could also participate with the Food Not Bombs Free Skool in Taos, New Mexico to gain more experience. Another great way to make a difference is to invite Food Not Bombs co-founder Keith McHenry to speak at your school, cafe, book store or other community space. This is a great way to inspire your friends, family and classmates to join you in taking action. Another way you can build interest is to invite the Autonomous Play House to perform their puppet show in your community. Their shows are sure to inspire participation in your community organizing efforts. Finally you can help by contributing to the completion of the Food Not Bombs Free Skool Solar Pump House and support another season of gardening, education and organizing at the school in Taos, New Mexico. Check out the cool video about the construction of the solar pump house. The pump will be powered by a donated solar cell and our showers will be heated by the sun as will the entire building. We intend to complete our fundraising drive by the 25th anniversary of the first arrest of Food Not Bombs on August 15, 2013. Please share this email and ask your family, friends and classmates to support Food Not Bombs. Start or support a Food Not Bombs group in your community. Invite THE SMASHING HUNGER SQUASHING CAPITALISM TOUR with Food Not Bombs co-founder Keith McHenry to your community.